Teething ring made for my niece Taylor. I found this pattern on http://patchyapple.wordpress.com/ . I actually finished it awhile ago but I wanted to surprise her Mommy too. I made one out of all turtles for my son too but he took it before I could take a pic! I chose these fabrics because of our nicknames for our kids. Monkey for Tay-Tay, Ladybug for AJ and Turtle for Stevie. I plan to make more since they were so easy and so cute!!! 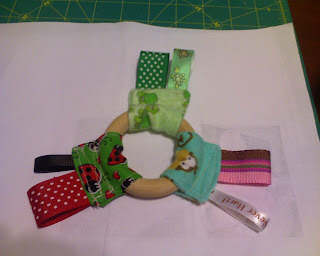 One thing Im going to try is to have one ribbon elastic to hold a pacifier. This is my Work In Progress quilt for my father-in-law. Its made using a easy pattern called Sticks and Stones that I tend to use alot. 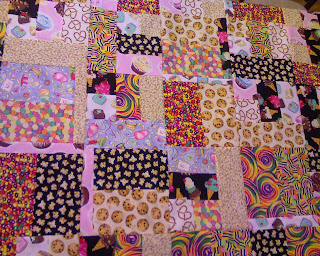 I chose 15 snack-themed fabrics. Its a larger quilt. Thats why its taking me longer to finish but it is a really fun one!!! 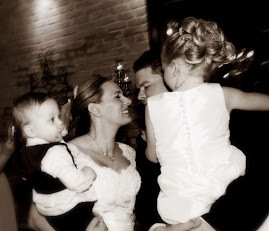 My hubby loves his family!!!! How could anyone resist this face?! My baby lost her first tooth!! !